Blurred lines between the parent company and subsidiaries could leave utility customers paying more in the long run. The bankruptcy of FirstEnergy’s coal and nuclear subsidiaries could shed new light on the relationships among the parent corporation, its regulated utilities and the generation affiliates. The ties between FirstEnergy’s various businesses will likely face scrutiny during the case to decide how its generation subsidiaries will satisfy their debts and what happens to the businesses, according to legal and utility experts. If the judge decides the parent company is on the hook for some of the coal and nuclear companies’ debts, that might ultimately put pressure on FirstEnergy to seek more revenue from its utility customers. The businesses are supposed to be independent, but consumers advocates and watchdog groups have long questioned dealings among FirstEnergy’s affiliates. As regulated monopolies, the company’s Ohio utilities have a duty to act in the best interest of customers and not make decisions to benefit other affiliates at ratepayers’ expense. In large part, FirstEnergy has kept details of these interactions from being made public in its Ohio utility cases by treating them as confidential business information. Similar claims will likely be made in the bankruptcy proceedings. FirstEnergy’s Ohio utilities operate as regulated monopolies to deliver electricity to customers in their service territories. Since 1999, however, the electricity generation market in the state has been deregulated, and customers are able to buy electricity from suppliers of their choice. The state’s utilities have collected billions of dollars in above-market charges to help compensate them for the change and loss of a guaranteed source of profits. The Ohio electricity market still has not moved to full competition, according to critics such as policy analyst Noah Dormady at The Ohio State University. In his view, reliance on so-called Electric Security Plans has resulted in above-market fees and led to higher energy prices in Ohio. FirstEnergy’s generation subsidiaries are in Chapter 11 proceedings in the federal bankruptcy court in Akron. The parent corporation FirstEnergy is a major secured creditor in the case, filed on March 31. In bankruptcy proceedings, a secured creditor stands in line before unsecured creditors when it comes to getting paid. The bankruptcy case will eventually work out a plan to deal with the subsidiaries’ debts. The case will also address what happens afterward with their business or assets, including large nuclear and coal-fired power plants. For the past five years, critics in FirstEnergy’s ratemaking proceedings have taken the position that utility customers should not have to pay costs that could directly or indirectly subsidize FirstEnergy’s generation subsidiaries. One pending appeal involves a charge imposed on FirstEnergy’s utility customers to boost credit ratings before the company finances grid modernization projects. Earlier in that case, FirstEnergy tried to make all of its utility ratepayers guarantee sales for affiliated coal and nuclear plants. When federal regulators said they would scrutinize the deal, FirstEnergy withdrew that plan and substituted another gambit to collect the same amounts. Now the bankruptcy case will also likely examine dealings among FirstEnergy’s affiliates. “The issues raised by, among other things, pricing, hedging and shared services and operations with FirstEnergy or its other non-debtor subsidiaries raise endless questions,” said bankruptcy lawyer Christopher Peer of Wickens, Herzer, Panza, Cook & Batista Co. in Avon, Ohio. If creditors shift liability for some of the generation arm’s debts to the parent corporation, that could impair FirstEnergy’s ability to collect on its subsidiaries’ secured debt. That, in turn, could affect FirstEnergy’s overall financial position. However, the October 2016 order allowing that charge focused not only on the utilities’ credit rating, but also on that of the parent corporation FirstEnergy. The charge could be renewed for two more years after 2019. The case is currently on appeal to the Ohio Supreme Court. One charge has been that funds could be distributed to the parent corporation and indirectly subsidize the generation arm or make up for the bad business decisions relating to that arm. 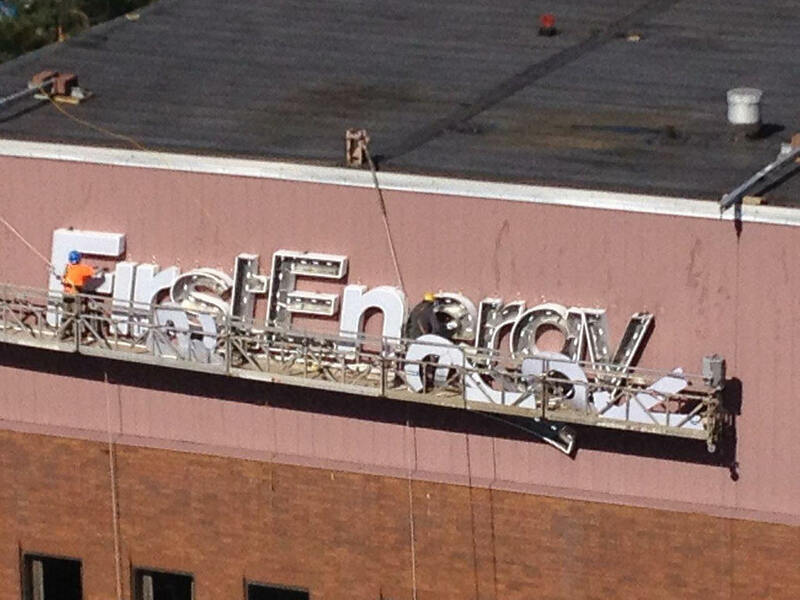 If state regulators do consider renewing the charge, it’s unclear how the bankruptcy case would affect FirstEnergy’s credit rating. If creditors successfully attack any alleged sweetheart deals, then it’s possible that FirstEnergy’s own credit rating might suffer. And that might indirectly affect its utilities. On the other hand, it’s possible that the proceeding might effectively insulate FirstEnergy from debts and liabilities of the generation arm. “If they come out of bankruptcy court without having some piercing of the corporate veil and all of the creditors have to take a huge haircut…, I would say they’re looking rather pretty,” Munson said. FirstEnergy plans to release its first quarter results today. The company has not provided a clear plan for a reorganization of the generation subsidiaries’ businesses, and it’s unclear what will happen with them. A bankruptcy court order earlier this month let the companies continue to operate while the bankruptcy case moves forward. A hearing on some motions in that case is currently set for April 26. A creditors’ meeting is scheduled for May 30. Meanwhile, the Public Utilities Commission of Ohio has ordered FirstEnergy Solutions to provide details on how it will continue to meet obligations and financial guarantees for customers. That report is due May 4. “We appreciate PUCO’s attention to this matter, and efforts to ensure that FirstEnergy’s customers have reliable power and that FirstEnergy is held to their commitments in Ohio,” Leppla said. Shame on all of you. Greed. How dare you. The rich don’t make the world go around.